Not all games need to have AAA production and lots of killing. The industry has thankfully embraced indie products and the adventure genre in the last few years, for the joy of everyone who longed for more variety in our favorite form of entertainment. Campo Santo’s Firewatch is one of the most intriguing indie adventure games due in 2016, for sure. Its deceivingly simple, yet alluring graphic style has been modeled after a painting made by Olly Moss. The story is similarly inviting: you’re a volunteer fire lookout in Firewatch, just taking control of your own tower in the forest when strange occurrences start happening around the main character, Henry. His only way to communicate with his supervisor Delilah will be the walkie-talkie you’ve seen in the screenshot above, and it will be possible to choose different dialog options. We’ve reached out to Nels Anderson, designer and programmer at Campo Santo, to learn more about the game (due on February 9 for PC and PlayStation 4). Enjoy! Why did you specifically set the game in Shoshone National Forest? Also, how big is the explorable area in the game? The Shoshone National Forest is near where both Sean and myself grew up. Sean especially spent a lot of time there when he was younger, hunting with his dad and similar things. So when the idea was had for a game about isolation in the wilderness, Shoshone just made sense. As for how big it is … heh, I’m not really sure. It feels pretty big to me! It’s obviously not some bonkers Skyrim/GTA scale or anything like that, but when I make my way through the game, I’m often reminded that there actually is quite a bit there! Clearly, the relation with Delilah is central to Firewatch. However, while in some previews I’ve read that your answers to her will make a difference, in others I’ve read that there are no branching paths or multiple endings. Can you explain what kind of difference will player choices make in the game? Our hope is that Delilah will feel like a real person you come to know through the course of the game. The kind of experience you’d build with a real person – shared moments, in-jokes, etc. And the shared history changes on how you make your way through the story and what you choose to talk about. There isn’t the kind of “good ending/bad ending” setup that somewhat belongs to Western RPGs but a more nuanced and organic experience. When two different people play Firewatch, after they’re done, we hope they’ll be able to surprise each other with stories about different things that happened in their respective games. Can we expect to have to deal with puzzles in Firewatch? There aren’t Myst-esque puzzles or anything like that. You’ll certainly have to engage with the game’s systems to make your way through the story, but you won’t be needing to rearrange scrambled letters to spell a word or match coloured tiles or anything like that. How many hours of gameplay do you reckon players will get out of the game, on average? It’s pretty hard to say since there’s actually quite a lot of “off the beaten path” areas in the game that players won’t have to visit. On average, I’d say maybe 5-6 hours … ? When I play it, it feels comparable to the length of a trilogy of movies or a TV mini-series. Do you intend to release free/paid DLC after the launch, perhaps expanding the storyline? Nope, Firewatch contains the entire story we wanted to tell. It doesn’t really lend itself to an expansion of that sort. Firewatch seems like a nice fit for VR. Are you considering support for devices like Oculus Rift, HTC Vive and PlayStation VR? We certainly think VR is cool, but given our very small team size, we don’t have anything specific planned for VR right now. Getting a game that wasn’t built specifically for VR game to really feel good is actually quite challenging, so if we wanted to do something there, we’ll definitely need to roll up our sleeves and dig in. At E3 2015, you announced that the game would be a console exclusive for PlayStation 4. Does that mean that Firewatch is never coming to Xbox One or is there a chance in the future? 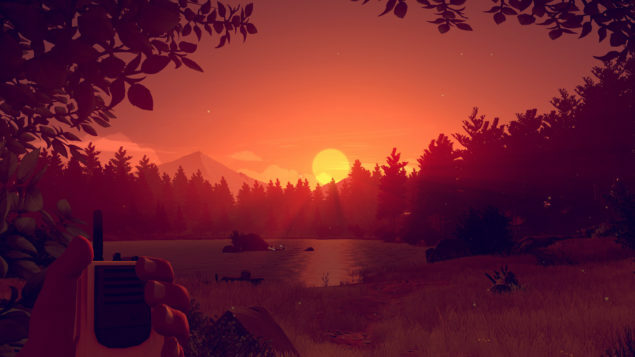 Firewatch is making its console debut on PS4 and will be launching alongside that on Steam. We don’t have any other platform announcements at this time.